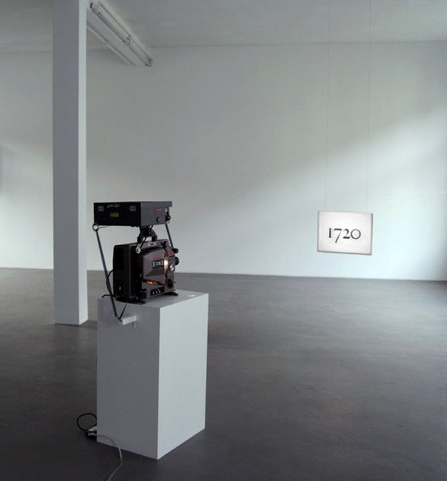 The date 1720, set in black Caslon type on a white background, is projected on a small suspended screen while the third movement of Johann Sebastian Bach's Sonata in G major for Flue and Continuo is heard on the film's soundtrack. William Caslon began producing the printing font, or typeface, that bears his name in London in 1720. Caslon's were the first moveable type produced in England. They ended British dependence on Dutch and French typefaces and helped to modernize book design. That same year, in Köthen, Germany, J. S. Bach is believed to have written his Sonata in G major for Prince Leopold. The third movement of this work has a duration of two minutes and thirty seconds—the same length as the running-time for a one-hundred foot roll of sixteen millimeter film. The film becomes an intersection between aural and visual artifacts that share a common date of origin but are otherwise contingent.